RasterEdge DocImage Barcode Add-On SDK for .NET contains several DLLs / libraries to meet multiple image processing and manipulation needs, among which barcode reading and writing abilities are included. The RasterEdge.Imaging.Barcode.Creator.dll allows C# developers to easily generate ISBN linear barcode on images (supported image formats: GIF, BMP, PNG & JPEG) and documents (supported documents: PDF, TIFF, Excel, PowerPoint & Word). You can easily generator ISBN barcode and save it to image files/object using this C#.NET barcode generator control. The following steps will show how to create a ISBN type barcode encoding numeric data text "978047082163" into the image object with XImage.Barcode.Creator. Please copy the sample code as follow to generator a ISBN barcode. RasterEdge barcode generator add-on control library supports creating / writing ISBN (International Standard Book Number) in C# project & program. Displayed below is the Visual C# demo code to create an ISBN encoding "978047082163" on a sample png image, and save it to your local disk C. You can also change the sample image to a jpeg, gif or bmp image. Besides the image formats listed above, RasterEdge .NET barcode generator component can also create and print ISBN on these files: PDF, TIFF, Microsoft Office Word / docx document, Excel and PowerPoint. Five samples are provided below for ISBN barcode writing on each of these five documents. Some simple barcode settings are offered in the codings and you can also make more adjustments with the properties from the table in the following section. Besides, C#.NET users can freely control the specific location of ISBN barcode on sample image by setting x and y coordinates using C#.NET programming language. Here is the Visual C# demo code with the complete ISBN barcode settings listed in the above property table. 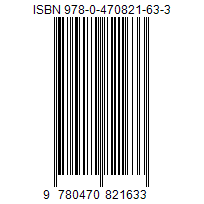 Please copy it to your C#.NET imaging program for ISBN barcode drawing.